All the leftover turkey bones and skin, all leftover vegetables and leftover sauces, gravies. • 3-4 bay leaves, 12 peppercorns, about 3-4 whole cloves, two blades of mace (if you have it), some parsley and thyme or a bouquet garnish. All quantities are approximate. Use as large a saucepan as you have. I always do this on St Stephen’s Day as the fresh Turkey makes the best soup. Trim off any pieces of meat from the carcass and keep for using in other recipes and in the soup. Break up the carcass and bones into pieces small enough to fit into a large saucepan. Add in any leftover skin, gravy, stuffing or giblets. If you have a ham bone add this in as well. Wash and roughly cut up the raw vegetables. Don’t boil the carcass but keep it at a simmer, just barely bubbling as this makes a nicer stock. If you boil it will become cloudy. Simmer for 3-4 hours making sure that it never boils dry and that all the ingredients are covered with fluid. Strain the liquid through a fine sieve while still hot. Leave the stock in the fridge overnight to allow any fat to harden. Remove the fat (good for using to make roast potatoes!). 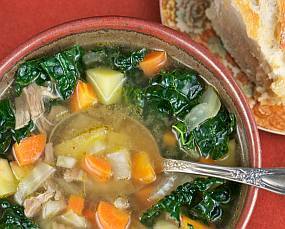 add to the stock any leftover cooked vegetables, pieces of turkey and ham, a tablespoon of dried soup mix (the mixture of lentils, split peas and pearl barley), some chopped mixed herbs such as parsley, thyme, sage. If you don’t have any leftover veg, chop a mixture of root veggies up into small cubes or use a frozen mix, plus a few peas. Add in some leftover cranberry sauce and bread sauce and some stuffing - if you have some. Bring to a simmer for about 20 minutes to half an hour. Season with salt and pepper. Serve with fresh bread after a long post Christmas walk or a day at the races. You could also add in some rice or noodles instead or as well as the soup mix. A dash of curry powder or chillies gives it a nice kick.